"We have a close community feel on campus and Repeat Signage is a powerful tool to help show how great our community is". US school. The Repeat Software gives you an outstanding level of support with free training videos and we have satisfied customers across the US. "Repeat Signage is a powerful tool to help show how great our community is". "Merryhill School in Roseville, California, is part of the Nobel Learning Communities Inc., a network of more than 180 private schools with a commitment to outstanding preschools, elementary and middle schools. Our schools around the country are all supported by the Nobel Learning Communities Education Department, a team of highly skilled experts in curriculum design, instruction and assessment". "We wanted a way to communicate with our parents a variety of information. We are a small school and we wanted to be able to provide information on our various events and at the same time have the ability to show videos of events passed. We have a great community feel on campus and Repeat Signage is a powerful tool to help us show how great our community is. The decision to move to digital signage from PowerPoint was easy. We wanted something that would be dynamic, customization and eye catching for our parents. We wanted more flexibility when it came to how to display content and what types of content we wanted to display". 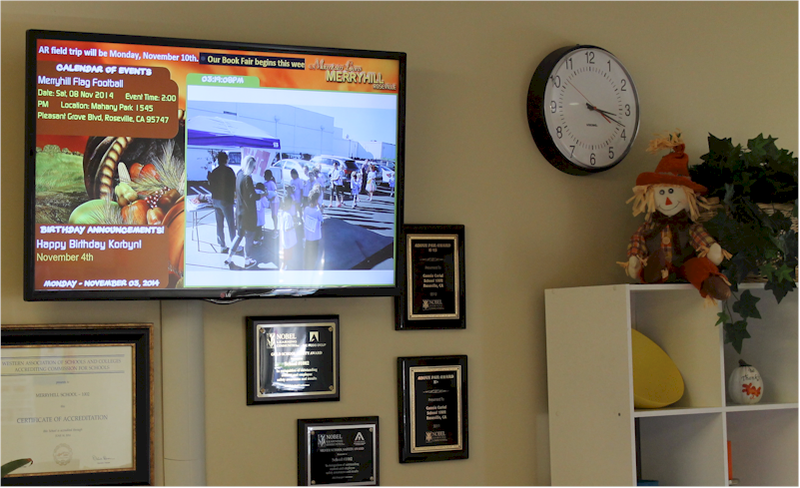 "With Repeat Signage digital signage software we were able to display vital information for our parents such as upcoming events, student information and information about our school community. 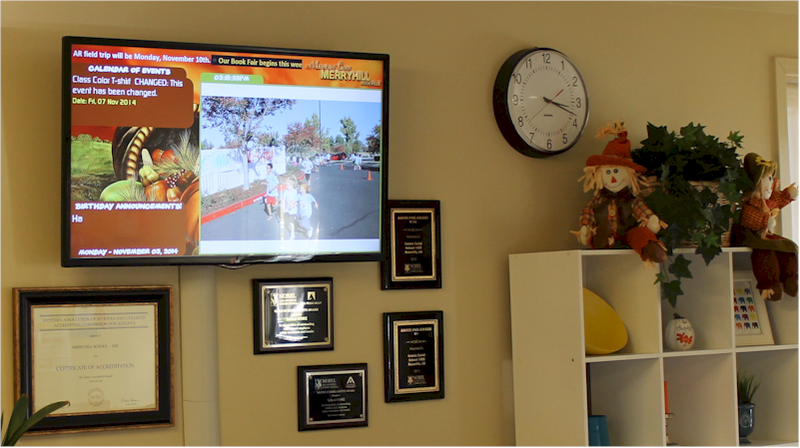 Repeat Signage gives us the ability to display current events using an RSS feed from our school's online calendar, display a ticker of information for quick notices for parents, a way to recognize our students birthdays each month and a slideshow of our students at various events. The flexibility of the software makes it easy to create screens that can be themed for holidays or to show our school colors. The ability to add music playlists allows us to play festive music for our holidays without having to manage an audio player. Being a small school we wanted something that was easy to use, fit our budget and could be implemented with ease. For us this was simply hooking up a television to a PC and running Repeat Signage software on that PC. The setup was pretty easy and the results have been extremely positive. Our parents are amazed and love being able to come in and see what is going on in our school community".